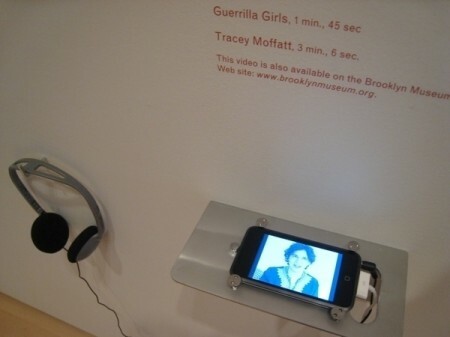 Shelley Bernstein over at the Brooklyn Museum has posted some details on their recent hack of the iPod Touch to use in the gallery. Shelly hasn’t posted all the details on the blog, but if you contact her, she will be happy to link you up to the juice. If you’re looking to do something like this in a gallery, it’s a great head-start. The screens are offer a high resolution and an acceptable size. They’re small and unobtrusive, so they have the potential to not irritate curators who dislike too much stuff near the art. The playback hardware is contained right in the unit, so no need for extra wires to a DVD player or other playback device. They have WiFi, so there is potential for remote administration, updating, and connecting to content on the Net. If you get a first generation, they’re hackable. The second generation will probably be hackable soon. Thanks to things like Cydia, you can install SSH and all kinds of useful goodies. The interface is simple. Though I’m not sure if my grandma would know how to interact with it. The only real downside to the IPod touch is the cord comes out a weird angle, making the mounting and display a little tricky.